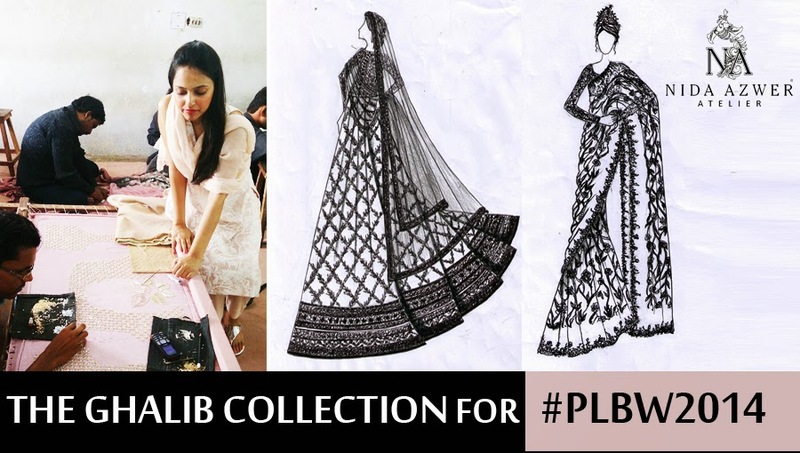 Following the brand’s showcase of their acclaimed “Kothari Parade II Collection” in Karachi, Nida Azwer atelier brings to the runway, "The Ghalib Collection" at the PFDC L’Oreal Paris Bridal Week 2014 on October 2, 2014 in Lahore. This is the third time the brand will be showcasing at the prestigious bridal fashion platform. As the name suggests, the brand draws inspiration from the mysticism and poetry of the renowned poet, Mirza Ghalib. In this collection, Nida Azwer works with hues of blue, navy blue, teal, grey and shades of light pink on fabrics such as silk, net, lame, tissue and brocade. One can anticipate short shirts, jackets, saris and farshi ghararas embellished with cutwork, crystals, zardozi and resham, paired with exquisite resham embroidered chadders, shawls and stoles. With this collection, Nida Azwer pays homage to the elaborate and grand silhouettes of the Mughal Era. The Ghalib Collection will also feature menswear. “This collection is a tribute to the great Mirza Ghalib. It takes you on a journey to an era of grandeur and luxury. We take inspiration from the intensity of Ghalib’s poetry to create majestic pieces using different forms of embroidery on majestic colors." For more information regarding the brand, log on to www.facebook.com/nidaazwerfashionhouse or follow the brand on Instagram: @NidaAzwerAtelier.